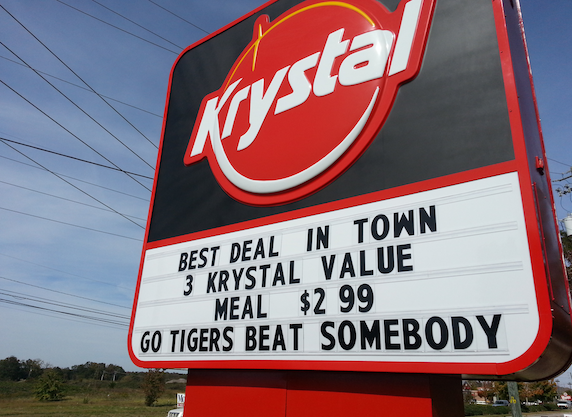 UPDATE: Has the marquee at the College Street Krystal received attention (you know, other than our post). Diana, the manager on duty during Tuesday’s lunch rush laughed for five seconds, then said yes. The “Go Tigers Beat Somebody” message was ordered up by the store’s owner, who declined comment. But we’re told he’s a die-hard Auburn fan. It’s on the other side, too. Krystal marquees have always been the voice of the people. 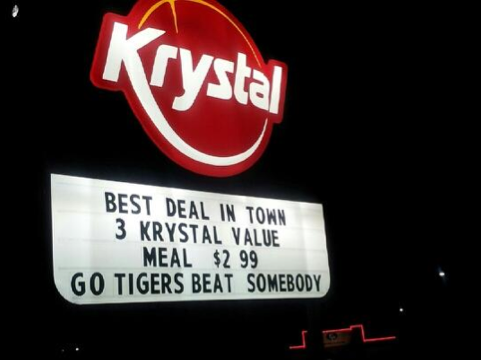 And the people of Auburn are as hungry for wins as they are a three Krystal value meal. Oh Heisman Special at the Opelika Huddle House… you’re so far away. Related: Momma Goldberg’s schedule poster can’t bring itself to list the Texas A&M score. h/t Justin Lee; photo: Tiara Tuck. Also- really, please beat somebody. WDE! He is a good Auburn man. And like a lot of good Auburn men, he is ready for a W.